About a year ago, I made a commitment to read all the H. P. Lovecraft I could find. Finding it all was easy. You can get the entire short stories and poetry, including some essays, all in one volume for your Amazon Kindle for something like ninety-nine cents. Reading it wasn't that difficult either. If you've never read Lovecraft, or even if you have and loved it, I would highly recommend that you read a short story then go over to The H. P. Lovecraft Literary Podcast and listen to the corresponding episode. Chris and Chad, who host the show, are both awesome. H. P. Lovecraft is a fascinating writer of dark fantasy/science fiction/horror. Where I simply admired the man’s work earlier, he has now become a favorite. But I am now learning of even more fascinating authors; writers who are taking horrific and weird fiction in the vein of Lovecraft in entirely new and refreshing directions. One of these writers I’m speaking, of course, is Thomas Ligotti. As an avid reader, I've heard of Ligotti’s fiction for years now. His work has even been recommended to me many times, but for some reason I never got around to it. Such is life. I don’t know how many books I have in my to-be-read mountain, a lot of them from authors I've never read before. 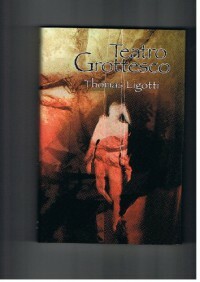 Thankfully, however, I recently decided to give Ligotti’s Teatro Grottesco a try. It, of course, is brilliant. I somehow knew that it would be, and so I regret not having read this man’s work before this year. What I like about Ligotti’s work the most is how much it seems to speak to me. Nearly every theme is a topic I have thought of more than once in one way or another. The overall landscape and pure beauty within the stories themselves is almost like opening my ribcage or cracking a hole in my skull and seeing what’s inside. Stories like Purity, The Town Manager, Sideshow and other stories, and The Red Tower were fascinating journeys into nightmares perhaps a little too familiar. Other stories, like My Case for Retributive Action and Our Temporary Supervisor come straight from my life. These stories are not simply stories. They are art. They are a mirror to any soul with substance. I look forward to reading more from Ligotti, and I can’t recommend him enough.